Those in the know have used coconut oil for years, but now the mainstream is catching on. Here’s what you need to know about coconut for skin care. As you would expect, coconut oil comes from coconuts. It’s an all natural oil, composed of saturated fats (about 90%) and small amounts of polyunsaturated and monounsaturated fats. These saturated fats are the source of the medium chain fatty acids which make coconut oil so beneficial for health. Medium chain fatty acids make up around 65% of the fatty acids in coconut oil. What’s The Difference Between Coconut Oil and Virgin Coconut Oil? There’s a huge difference in quality between coconut oil and virgin or extra virgin coconut oil. Regular coconut oil is made from copra which is dried coconut flesh. By the time it reaches the mill for processing, copra is often moldy and/or rancid. It takes a lot of heat to process copra, and the resulting oil is a foul smelling, brown liquid. This oil is then refined, bleached and deodorized to give it the appearance of pure white coconut oil. Virgin and extra virgin coconut oil are made from fresh coconut flesh. The best virgin coconut oils, like the oils from Nutiva, are cold processed using an expeller press to squeeze the oil from the fresh flesh. This wet processing method preserves the nutrients in the oil, and produces the healthiest kind of coconut oil. For a truly luxurious and easy to apply moisturizer, you can make your own coconut oil body butter. When coconut oil is stored at room temperature, it can be difficult to get out of the jar, especially during the winter months, when dry skin needs all of the help it can get. Rock hard is a good description of coconut oil in the winter. A body butter solves that problem, giving you a soft, light moisturizer to scoop up, instead of one that you need to literally dig and scrape out of the jar with a spoon. Here’s how to make your own. A hand mixer or a stand mixer – KitchenAid mixers always do a good job. Food processors won’t work for this because they produce too much heat which will prevent the oil whipping successfully. 1 cup of virgin coconut oil – don’t melt it, it needs to be solid for whipping. 20 – 30 drops of essential oil. This is optional, but essential oils will give your body butter a lovely fragrance, and as a bonus, if you use oils like sandalwood, geranium, frankincense, lavender, or German chamomile, you’ll get additional nourishment and protection for dry skin. Place your ingredients into a bowl and mix for about 6 – 7 minutes until you get a fluffy, whipped consistency. If you’re using a hand mixer, you may need to whip for a little longer to get the right texture. Transfer your body butter into a clean jar or plastic tub and pop the lid on. Whenever you need to moisturize, you’ll have a rich, light body butter, that will glide onto your skin with ease. Coconut oil is rich in lauric acid (about 50%) and capric acid (about 8%). These fatty acids pack a powerful punch against acne because they are antibacterial. As coconut oil sinks into your skin, these antibacterial acids will help to control any bacterial overgrowth in the pore. The anti-inflammatory properties of coconut oil will also help to calm redness and irritation. Finally, coconut oil may improve your antioxidant levels, and low antioxidant levels are heavily implicated in the chain of events that lead to acne. So far, the antioxidant research has only been carried out on rats in laboratory tests, but the results are encouraging. During a 45 day trial, rats were given sunflower oil, copra oil, virgin coconut oil, or olive oil. At the end of the trial period, the rats fed virgin coconut oil had improved antioxidant status compared to the rats fed the other oils, and these rats had lower levels of lipid and protein peroxidation. We know that squalene, a component of the sebum (lipid) produced by the skin’s sebaceous glands, turns into squalene peroxide when it is oxidized, and squalene peroxide is highly comedogenic (pore blocking). So by using coconut oil on your skin and by including it in your diet, you could see improvements in your acne. But isn’t coconut oil comedogenic, doesn’t it clog pores? Modern testing, using the Draelos Human Skin Assay method (DHSA), has shown that virgin coconut oil is non comedogenic. However, different skin reacts differently to the same substance. If your skin is very acne prone, then coconut oil may be the straw that breaks the camel’s back, triggering a breakout. If your skin is mildly acne prone, you could be fine. Like all things acne related, you’ll have to try it out to find out if it works for you. But be smart about using it. Patch test on a small area first before you use it on the rest of your face. Fractionated coconut oil which has had its long chain fatty acids removed is well known to be non comedogenic, and those with acne prone skin can use this liquid version of coconut oil without worry. Researchers have confirmed the anti-inflammatory effects of coconut oil. 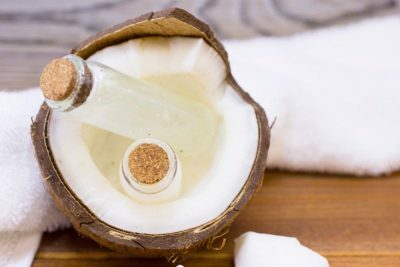 Again, the research so far is limited to lab animals, but it has nonetheless demonstrated that application of coconut oil does reduce inflammation. 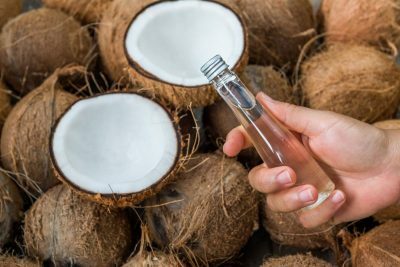 During the research, coconut oil was applied to the inflamed ears of rats, and not only did it result in less inflammation, the coconut oil also reduced pain levels. One type of rash that is an ideal candidate for some tender loving coconut oil is diaper rash. Coconut oil will relieve the itch, soothe sore skin, and help to prevent infection while helping skin to heal more quickly. Apply coconut oil before smoothing on regular diaper rash cream which forms a barrier against wetness on the skin. If you have eczema, you know how careful you have to be when it comes to choosing skin care products. Pick the wrong lotion and you can cause a flare up, or make an existing patch of damaged skin much worse. The culprits in lotions and creams are usually fragrance ingredients or preservatives, and while you can find plenty of fragrance free products, it’s not so easy to find ones that are free from preservatives too. For preservative free products you have to look too sterile skincare formulations made in sterile facilities and packaged in special anti contamination tubes and bottles. And these are expensive! Coconut oil, however, doesn’t contain any synthetic fragrances or preservatives, and research has shown that it is really beneficial for eczema. A randomized, double blind clinical trial (the gold standard of clinical research) evaluated 117 pediatric patients with mild to moderate atopic dermatitis (eczema) over an 8 week period. Baseline SCORAD (a measure of eczema severity) and transepidermal water loss scores were recorded at the beginning of the study. Patients were treated with either virgin coconut oil, or mineral oil. SCORAD measures indicating the severity of the eczema, reduced by 68% in the virgin coconut oil treatment group, and by 38% in the mineral oil group. Transepidermal water loss (TWL) which at baseline measured 26% (mean average) dropped to 7% in the coconut oil group. The mineral oil group had a mean TWL of 24% at baseline which dropped to 13% after treatment. As you can see from these results, coconut oil is a more effective eczema treatment than mineral oil, and mineral oil is a main ingredient in many eczema lotions and creams. Have you ever wished skin care could be easier, less time consuming and not so expensive? Well, you’re not alone, and people are increasingly turning to coconut oil for all in one daily skin care. Coconut oil can be used instead of cleanser, toner and moisturizer, and it’s great for removing makeup too. Massaging coconut oil into your skin dissolves makeup and loosens grime. After allowing the oil to soak in and clean deeply, all you need do is use a cotton pad or warm washcloth to wipe away the residue. Because you haven’t used any alkaline cleansing products that disturb the skin’s PH balance, you don’t need to use toner to correct that imbalance. As for moisturizing, if you have normal skin, you may find that your skin received enough moisturizing from the initial application of coconut oil, but if you have dry skin, you’ll want to smooth on a little extra oil. Apply more coconut oil overnight for even softer, hydrated skin. Coconut oil can also replace your body lotion and your hand cream, so that’s another couple of products you can cross off your shopping list! The underarm region is often neglected when it comes to skincare, and because this delicate region really takes a hammering from hair removal methods, the skin here can experience soreness, irritation and dryness, and boy can it get itchy. Regular deodorants contain alcohol, which stings sensitive skin and makes dryness even worse. Cream deodorants are kinder to the skin, and it’s easy to make your own cream deodorant at home with coconut oil and a few other simple ingredients. 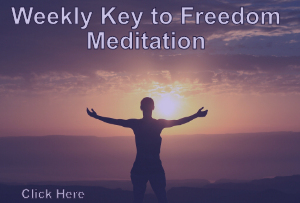 20 – 30 drops of the essential of your choice (optional). If you include a few drops of tea tree essential oil, you’ll get added antibacterial action, and it’s bacteria that cause BO. Add a few inches of water to a saucepan, and heat the water until it begins to simmer. Place the jar into the simmering water and stir the coconut oil and shea butter until melted. Remove the jar from the pan and add the baking soda and arrowroot. Stir well to mix. When the mixture begins to cool, add the essential oils and mix well to distribute the oils evenly. The deodorant will solidify as it cools completely. You can store the deodorant in the jar, or you can put it into old deodorant sticks or empty sticks like these. As well as being antibacterial, coconut oil has antiviral properties, so it can help to speed up healing whenever a cold sore rears its ugly, painful head. Simply dab a small amount of virgin coconut oil onto the sore several times a day (don’t forget to use some overnight). Once your cold sore is healed, it’s a good idea to use coconut oil as your daily lip balm, to help prevent future cold sores. You can add 4 or 5 drops of peppermint oil to an ounce of coconut oil if you prefer a flavored lip balm. What do use when you shave your legs? Soap or shower gel? These are drying for skin, and they don’t give enough slip to truly protect against nicks and scrapes. Shaving gel or foam? Messy, and yet another product to buy and clutter up the bathroom with. Coconut oil makes the perfect shaving cream. Your razor will glide over your skin without nicking or scraping, and you’ll get an extra close shave with no risk of shaving rash or ingrown hairs. When you’re done, your legs will be smooth and moisturized. You can use coconut oil straight from the jar or you can use the body butter recipe above, with or without the essential oils. This works for manly shaving too fellas. Skin needs some TLC after it’s been exposed to the sun for any length of time, and this holds true even if you’ve used plenty of sunscreens. Sun exposure dries out skin, and even a hint of a tan means that skin has suffered damage, and if your skin is pink or red, it’s definitely in need of some special care. Coconut oil is soothing and moisturizing which makes it an ideal after sun balm. If you’ve spent too long in the sun, you can add some lavender essential oil to your coconut oil to make an effective remedy for sunburn. Lavender essential oil minimizes blistering and peeling, speeds up skin repair and eases the stinging pain of sunburn. Use 12 drops of essential oil for each ounce of coconut oil. Mix well and store in a clean container. Apply as needed after sun exposure. If sunburn is severe, use fractionated coconut oil because this is thinner than virgin coconut oil, making it easier to apply without rubbing, which can be too painful for very sore skin. You can also increase the amount of lavender oil to 20 drops. Cracked heels look unsightly and they’re painful too. But you can easily fix the problem with coconut oil and a pair of cotton socks. Before you go to bed, cover your feet with coconut oil, making sure that you’ve massaged a thick layer into your cracked heels. Pop your socks on and go to bed. While you sleep, the coconut oil will soften your skin and get to work on repairing the cracks. If you keep up your bedtime routine for a few days to a week, you’ll soon have smooth heels again. Once your cracked heels are history, you can switch to a once a week maintenance routine. Coconut oil is a fantastic all rounder when it comes to skin care. It’s natural, it works wonders, it’s inexpensive, and a little goes a really long way. Go and grab yourself a jar, your skin will thank you! I find straight coconut oil makes the skin feel dry. I make my own lotion with coconut oil, other veg oils like jojoba, aloe vera juice or lemon juice mixed with a little melted beeswax. Add scent if you wish. I don’t use commercial lotions anymore.